Learning and Development, like every other industry, has developed and evolved through the years. In the last decade it has increased its degree of importance, to the point where, according to a study by PWC it’s now become the number 1 aspect job seekers consider before joining an organisation or changing their workplace. But, as is the case with many things that change fast, it has become harder and harder to keep up, and most L&D professionals have seem to become an administrative machine that focuses on classroom centered courses for the general public of the organisation as opposed to helping develop and further grow each individual’s skills and career, thus helping the organisation and ultimately fulfilling one of the goals of L&D. Donald Taylor, a Learning and Development expert and author of book Learning Technologies in the Workplace who has studied the subject in depth, affirms that in order for L&D to evolve and continue to be sustainable, professionals in this area need to focus more in content creation and curation, depending on it’s importance and degree of relevance within the organisation. Having this in mind, and following previews work where L&D content has been divided and categorised, Taylor introduced the concept of the Learning Content Pyramid. To him, in order for L&D “to survive and to thrive” professionals need to “adapt their approach to content development”. Taylor’s Learning Content Pyramid divides all the content relevant to L&D in six key categories, explaining each one and their importance while organising them in hierarchy, regarding “contextual relevance” and “volume of materials”. The bottom 2 groups are composed of the most generic, non specialised content available. These are very easily accessible and can be useful for general knowledge but not necessarily trusted, nor for specific company related training sessions. The two in the middle are more specialised and relevant content, which is also available for the general public but is better trusted for its quality and origins. Finally, the upper two groups are content developed specifically for an organization and are only useful for them, for it is often related with internal policies as well as for procedures only relevant to the organization itself. The name speaks for itself. This refers to the seemingly infinite supply of content usually available on the internet (but not limited to it). This ranges anything from YouTube to online course suppliers such as Coursera, EdX or Udemy and everything in between including scientific papers, PDFs and blog posts. According to Taylor, the trick is to “build this (freely available content) into organizational learning in a helpful way rather than simply pointing people at a vast array of unfiltered resources”. Refers to the vast array of online learning materials, specifically courses that can be used by people in various roles and disciplines. Some examples are courses on Microsoft Word or Excel which demonstrate how to create pie charts and visualise data. This is not material specifically created for a group of people, but can be used by anyone for specific purposes, such as learning to use a tool or programme, in the general context. As was mentioned above, there is an immense amount of content out there which makes it rather difficult for any L&D professional or anyone whose task is helping with an employee’s learning path to decide which are the best resources that will have the highest impact for a particular role / required skillset. 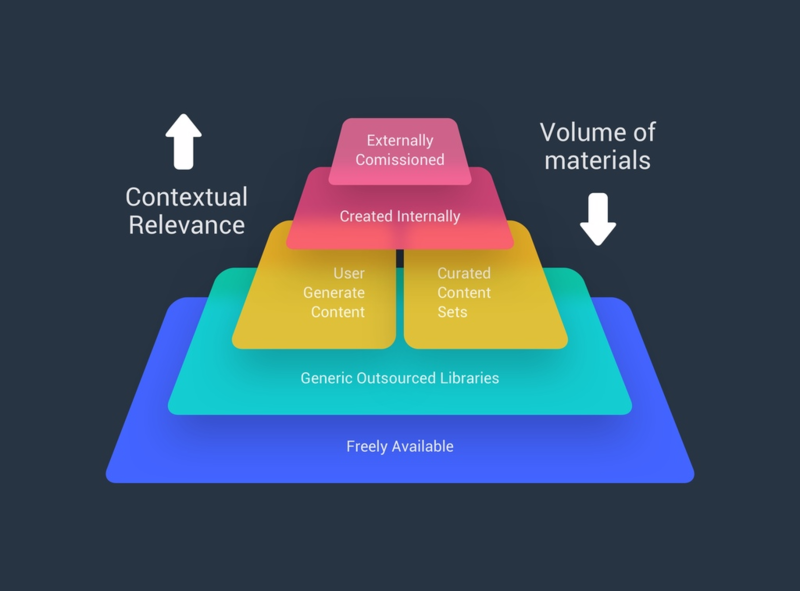 This is why some providers are starting to offer “curated content sets” that provide a higher level of context given they are designed with a particular role in mind. These may not have exact context related to specific organisations, but are designed to fit the vast majority of a specific group such as programmers, engineers, editors, etc. Within every organisation, a large amount of content is created constantly. Quarterly OKR’s, latest sales campaigns, sharing of good practises and updates in regards to logistics, meeting notes, among many others, are constantly shared among employees. And even though most of this information is not explicitly created for learning purposes, the value is obvious. Allowing teams to learn from others’ mistakes within the organisation as well as take advantage of their insights is a key element to help all the employees and the organisation itself grow and develop together and be at the top of their industry, which is something every company wants. However, setting up and maintaining the necessary systems to be able to take advantage of this user generated content can prove expensive and time consuming. Simply collecting the information is not enough, given the fact that it has to be organized in a fashion that makes it easily accessible as well as curated in such a way that is always up to date and takes obsolete material out of circulation. For more information on user generated content pro’s and con’s, click HERE. Internally created content must be purposely created to fulfill requirements that all previous forms cannot. It must be highly contextualized to the organization, its values and proceedings. This could also be content that is confidential and/or unique. Taylor cites an example where a company created such content for the “10 most common mistakes in handling returned goods” which ended up saving them US$35M in a 2 year period. (You can purchase his book HERE and learn more). There are certain instances when resources that are deemed very important and normally require higher production value are needed. For these cases, the content is generally commissioned to be made by a 3rd party or particular expert, to achieve the desired level of production and value. Since organisations can’t always produce content the way it’s needed, specialists or teams that can provide high production value can be hired in order to get it “just right”. This is inevitable with certain material but avoidable if every factor is considered before calling for its’ creation. While it used to be considered the only option for certain cases, Taylor warns that before going down this path, where the urgency of creating this content can come at such high cost, all previous alternatives must be considered. Nowadays we not only need to consider the quality of the material in itself, but also the durability, as it would be a waste to commission material that will be outdated shortly after generating it. It is also important to consider the impact it will have and how many people will actually take full advantage of it. After considering all the aspects, if it is still considered an investment, then go ahead and hire the service to get the material done. But if the cost of the material exceeds the ROI of it, perhaps a different route should be followed. Are we spending too much time creating our own content? How high do our production values have to be for this content? Are we using our internal (non L&D) experts well enough? What free resources could we benefit from? What is our most important content, and how should it look? What sort of content do we need to support this particular task? He states L&D within organizations must evolve from being content creators to content curators. Empowering employees with learning experiences as well as each person’s ability to learn. For anybody working within the space, Donald Taylor’s “Learning Technologies in the Workplace: How to Successfully Implement Learning Technologies in Organizations” is a must and a very easy read, which I would highly recommend.